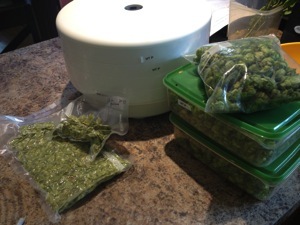 2013 hop crop – Working the bugs out. This is the second year we’ve had hops. Last year they went in the ground in late april. This year by that time, they were starting their way up the climbing lines. Last year they did ok, but my lack of diligence watering them, and fertilizing them hindered their growth significantly, limiting harvest to only a handful of cones. After last years watering struggles, I decided to get a watering setup so that I ensure they were getting regular amounts of water. It seems to have paid off. Since mid may I’ve watered 2x a day, for about 20 minutes. I made a simple drip irrigation system with a hose we were going to throw away, a hose cap, and $30 programable water timer. If you do any gardening, are forgetful, lazy, or just gone on a regular basis It’s well worth it. 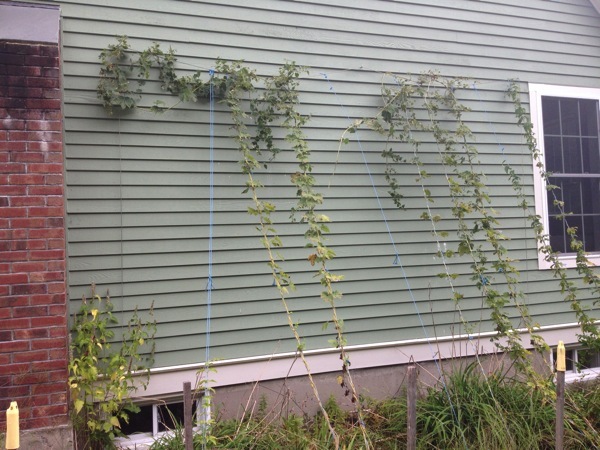 The hops did well all year. They reached the top of the trellis by June. I should have been hitting them with miracle grow by this point. I also I think that I stripped them back too aggressively. By stripping the bines near the ground I think I removed a good portion of their ‘solar pannels’ and stunted their growth. By July they had climbed all the way across the wire to the end and tried to climb the house, reaching maximum hight and width for the current setup. While I was happy with their progress, they were not as vigorous as some I’ve see. I was dismayed when I did not see much if any cone development. Finally over early august the cones started to grow. There was next to nothing before our cape cod trip, and I returned to significant cone growth. Ever since I’ve been watching them fill in. I’ve been following a few other local homebrewers / hop growers to see when they were planning on harvesting. They pointed me to a great video and pdf to _know_ when you should harvest, At between 20-23% dry matter. As well as the proper method to know when your hops are sufficiently dry. I did not do any dry matter testing before picking. I picked the first of september because it’s the only picking window I had. I also knew I wouldn’t have an opportunity until much later in the year. The picking was simple, using a few paper bags, I harvested all the cones w/in reach, then using an 8ft ladder I was able to pick the rest off the slightly lowered wire trellis. I got my share of scrapes on my hands and arms, the advise to wear long sleeves is a good idea, but I can’t imagine using gloves. I also ran into a small but angry wasp nest. That incident cost me abit of my harvest, but not any stings. The biggest challenge was separating the Hallertau bines from the cascades where they had overlapped. I did my best to pick in place as much as I could. It’s an advantage that us small growers have. This is reported to be better for the plants, allow the plants to develop more, and store more engergy in their root ball. The before and after is pretty neat. 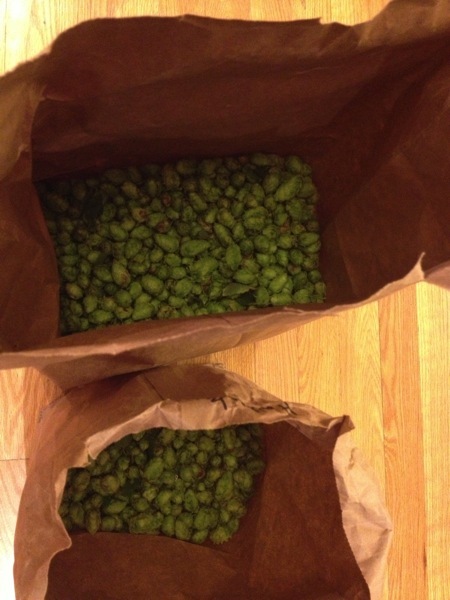 In total, I managed to harvest about 1.1k of wet hops. 500g Cascade, 500g Hallertau, and 100g galena. It should yield about 1/4-1/3 of that amount dry. Certainly enough for a batch or two. I’m currently drying them in a home dehydrator. My process is thus. Measure out 100g of hops put on one tray. Fill the others. After 3-4 hours, weight the 100g sample to see how dry they are, once they are less than 50% their original weight, remove them from the dehydrator, and store them in air tight containers for 6hrs. Then dry them until they are about 35% of their original weight. During drying I noticed some extra guests that were harvested along with my hops, aphids. They were all over the air tight containers, and all over the dehydrator after I started it back up. I’m just going to ignore them, hopefully the drying, freezing, and boiling will prevent any issues. I hope I can find a better treatment for them next year. With this in mind, I do not plan on dry hopping with them, these will be hot side only. My goal is to slightly under dry them, then seal them using a food saver, freeze, and brew with them as soon as possible. Ideally I’d use them to brew a local farmhouse ale, sourcing local grain to go with my own hops, and maybe even some locally harvested yeast. I recently read that a farm in Groton is growing barley, and winter wheat, If I can track that down then I’d be inspired to to capture some yeast, to make this a 100% local beer. Alternately, I’ll make a simple Saison with new England sourced grain, the Hallertau hops, and some pepperell honey. I’ll use the cascades and Galena in one my future pale ales, likely another batch of bitter new englander. 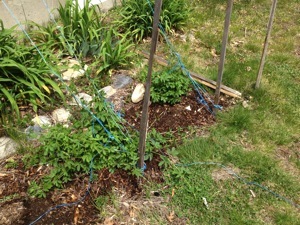 Overall I’m much happier than I was last year with the hops, I’m disappointed my centennial is not growing much at all. Here are my plans to make an improvement in next years yield. 1. Install a vertical trellis. 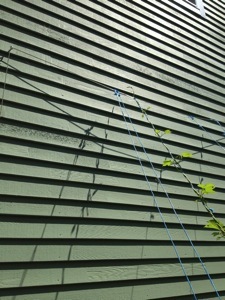 The current wire setup to the house is fine, but I don’t want to risk it, with how crazy hops can grow. 2. Compost to the hop mounds over the winter. First order of business is to get more nutrition to these plants. Compost now, fertilizer during the next season. 3. Don’t strip the bines back. I think I was a little over zealous stripping the bines back, and cost myself some cones. I think those lower leaves really direct energy to the growth of the plant. 4. Train a single bine. I over did it on my lines this year, and they were a tangled mess. I have to trust it to a single bine. 5. Acquire more rhizomes preferably already established. I’d like to get a functional centennial or two. I really love this hop, and would love to have more success with them. 6. Deal with the aphid problem. Applications of diatomaceous-earth, and a late application of lady bugs might help. 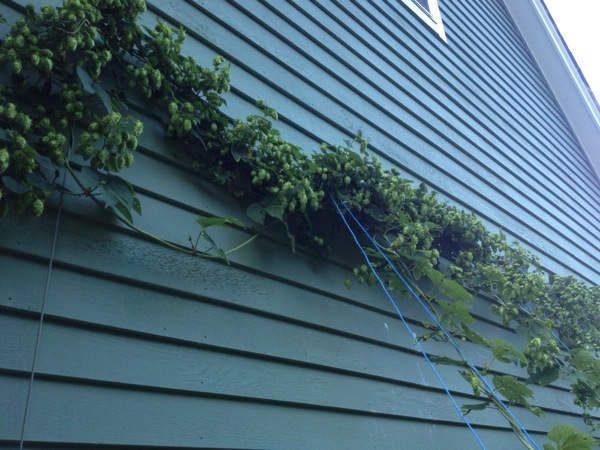 Click for a complete photo set of this years hop growth and harvest.